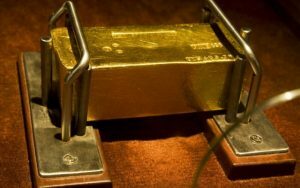 Gold futures finished Wednesday at their highest level in a week, then slipped under $1,250 an ounce in electronic trading after the U.S. Federal Reserve failed to offer any real hints of a potential change to interest rates at the next meeting in June. The policy-setting Federal Open Market Committee wrapped up its two-day meeting at 2 p.m. Eastern time on Wednesday, after gold prices settled on Comex. Ahead of the meeting’s end, gold for June delivery GCM6, 0.69% gained $7, or 0.6%, to settle at $1,250.40 an ounce — its highest finish since April 20. In electronic trading after the central bank’s announcement, prices lost ground to trade at $1,247. Meanwhile, the SPDR Gold Trust GLD, 0.29% was trading up 0.6%. 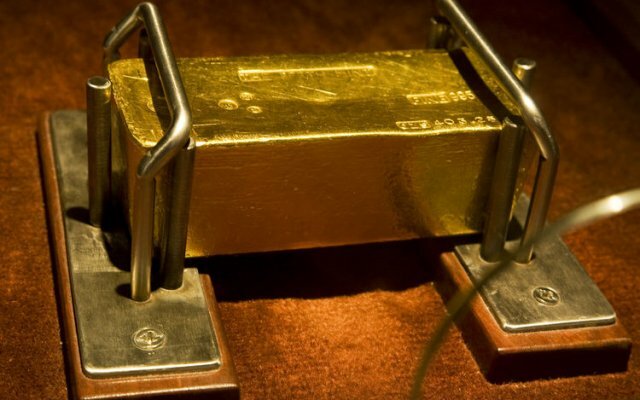 The Market Vectors Gold Miners ETF GDX, 1.09% climbed 0.9%. The Fed left interest rates unchanged and took a wait-and-see stance toward future hikes. It has tentatively forecast two rate hikes for the remainder of 2016; its next policy meeting will be on June 14-15. The tone of the central bank’s statement was slightly more upbeat than the one it made at the end of March. It highlighted continued improvement in the labor market and “solid” gains in household income. No interest-rate hike was expected at Wednesday’s conclusion of the FOMC’s confab, but any upcoming decisions the central bank makes on rates are likely to influence the U.S. dollar DXY, -0.68% Commodities priced in greenback often trade inversely with it, as moves in the dollar can influence the attractiveness of those commodities to holders of other currencies. Before the Fed news, Naeem Aslam, chief market analyst at AvaTrade, said the “global economic situation has improved considerably” and he expects that “the Fed will start prepping the market soon enough” for a rate increase. Economic data on Tuesday, which showed signs of weakness in the U.S. economy, appeared to bolster the case for the Fed to hold off on raising rates this year. Orders for durable U.S. manufactured goods rebounded far less than expected in March. But data Wednesday showed that pending home-sales rose 1.4% in March, up a second straight month. Beyond the Fed, expectations remain high for the Bank of Japan at a meeting Thursday to take easing steps that presumably would be dollar-supportive. However, dollar/yen trading has been unpredictably lately. Meanwhile, silver for July delivery SIN6, 0.43% which saw higher open interest than the May contract, gained 17.6 cents, or 1%, to settle at $17.335 an ounce — the highest in more than 11 months. Rounding out metals trading Wednesday, July copper HGN6, -0.47% fell 2.2 cents, or 1%, to $2.225 a pound. July platinum PLN6, 1.28% rose $5.30, or 0.5%, to $1,025.40 an ounce, while June palladium PAM6, 0.35% added $5.15, or 0.9%, to $609.65 an ounce.